Those pictures have been sitting in my computer for over a week and I didn’t have time to publish them on my blog. With my six months old daughter, my days are pretty busy. She is a bundle of joy; sometimes I wonder where she gets all this energy from. Usually, we don’t go out on Valentine’s Day. Well first it’s not easy when your baby sleeps by 8 pm but also it is too busy, the restaurants are too much crowded and you end up waiting an hour to have a table. For us Valentine’s Day is a day like others. I don’t think you need a day to remind you about the people you love. For me, it’s just a good excuse to treat our self to a chocolaty dessert without feeling guilty about it. For the dinner I decided to go with fish. I don’t know why, when I think romantic dinner, I think fish: it’s delicate, light, quick to cook and healthy. That way you can have a second portion of dessert. “Brilliant!”. I started the menu with “Tapas of mussels, followed by “salmon steaks with mango sauce vierge”, and to finish it up a chocolate cake called “Sicilian”. Tapas are finger food in Spain. The word tapa in Spanish means a cover. This way of life comes from Andalusia. It started, so they say, with a piece of bread, soon topped with cheese. Then, it extended to a variety of local ingredients, revolving mainly around shellfish. 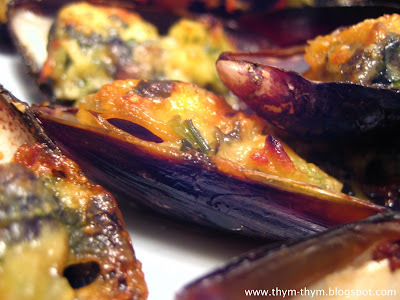 Here the mussels are broiled with a topping of parmesan cheese, garlic and parsley, which helps to prevent the mussels from becoming overcooked. Scrub the mussels thoroughly. Sharply tap any open mussels and discard any that fail to close or whose shells are broken. Place the mussels in a large pan and add water. Cover the pan with a lid and steam until the mussels shells have opened, shaking the pan once halfway through. Drain the mussels and discard any that are still closed. Snap off the top shell from each mussel, leaving the flesh still attached to the bottom shell. Place them in a flameproof dish and set aside. Mix the melted butter, olive oil, parmesan cheese, parsley, garlic and black pepper and spoon a small amount of the mixture on top of each mussel and gently press down with your fingers. Broil the mussels until they are sizzling and golden. Nettoyer bien les moules avec une petite brosse. Taper celles qui sont ouvertes avec le dos d’un couteau et jeter toutes celles qui ne se referment pas. Placer les moules dans une grande casserole avec l’eau. Mettre le couvercle et laisser cuire jusqu’a ce que les moules s’ouvrent, en veillant a agiter la casserole une fois avant la fin de la cuisson. Jeter celles qui restent fermees. Bien egoutter les moules, et enlever doucement un cote de la coquille de chaque moule en laissant la chair attachée a l’autre coquille. Mettre dans un plat a four et laisser de cote.Entre temps, melanger le beurre fondue, l’huile d’olive, le parmesan, le persil, l’ail et le poivre. Disposer une petite quantite du mélange sur chaque moule en enfoncant legerement avec les bouts des doigts. Faites passer sous le grill jusqu’a ce qu’elles deviennent dorees.